Kino sets off to yet another country: Tower Country. Here all citizens work on the construction of a massive tower, without knowing what purpose it serves. The rather odd encounter with a young boy adds yet another twist to the story. Well, i'm a fan and suspicious to talk about this anime, but i'll try to not be tendentious. This special episode is very good, with light mistery, fast action scenes, and mainly that calm and serene atmosphere of Kino no Tabi. The dialogues are good too. But i missed something about the end. The final question, that leaves the spectator wondering about similar meanings and things in our lifes, was not strong as usual. Also, the energy and excitement wasn't the same as we can see in the others episodes. Overall, a good story, worth watching. This second Kino's Journey special is simply your below average episode of Kino's Journey. She visits a country. Country is weird. Kino leaves country. I don't have much more to say about this special, but there's a minimum character requirement for reviews here so I guess we go into over-analysis mode here. I'm going to throw a spoiler warning right here as I will be spoiling this special, all of it. All 14 minutes of it. Kino rides into a country where everyone works on building a huge tower located in the heart of the country, and nothing else. It's appropriately pointed out that there are no inns in the country, and Kino has to sleep in a warehouse kind of small building. A young boy approaches Kino and tells her that he doesn't want to die working on the tower. He asks her to take him and make him a traveler. In Kino fashion, Kino declines. We don't know why they're building this tower. Not until it collapses under its own weight. Then it's revealed that every time the tower collapses, the country starts building another one in an endless cycle. The boy comes once again to Kino in hopeless frustration and asks for help. Kino then suggest that if they're tired of doing the same thing, to add some flavor to the tower. She suggests that they color or make designs on the bricks. The country's mind is completely shattered by the idea and they enthusiastically start building the next tower with designs on the bricks. Said, "Pray, which leg moves after which?" If one simply does something everyday, like work, go to school, ect. it becomes unquestionably routine. So when it gets questioned, one's reality can be shattered. Think of The Matrix. Everyone just assumes that life and the universe is as perceived. Once we start questioning that, we have a moment of existential crisis. I know both of these examples are very different, but it's a similar effect. This special is bad when compared to the best Kino's Journey episodes, but it's still pretty good when compared to all anime as a whole. It's interesting, and thought provoking. It's philosophical in a uniquely 'Kino's Journey' kind of way. If you liked the main series, you'll like this. To me, it seems as if this show is based off years and years into the future, where humanity has been alive for so long that they've lost most of their meaning to live. Each country Kino visits is so fixed on finding anything to give their life meaning, even if it looks silly to someone outside, and this episode makes it all the more tangible. With that in mind, I recommend watching this before starting the 13 episode series as it will open your mind to such a thought provoking show. This episode represents the whole show so perfectly by being so ridiculous. You have these people who live in order to build this tower. Once the tower has fallen down, they start over from the beginning. After living for so long, they yearn to find something to give their life a little more meaning. The tower here serves as a metaphor to that. Even if it's silly, it gives them something to do and something to live for. The other episodes don't feel as ridiculous as this one, so it's easy to question why is this and that is happening on them. This one is more blatantly metaphorical, so if you watch this first, you learn to accept the rest of the show for the metaphors and philosophy it is, rather than questioning in. This is why I think this episode is vital in understanding the rest of the show. Not to say you can't understand it without it or anything. I didn't rate this anything, but since mal forces me to rate it something I think a 10 if fair as it is was pivotal in my understanding of the rest of the show. I did not see a review for this so I decided to write one. I often see people confused of what order to watch anime especially when episode 00s and prequels are involved. A good rule to follow is watch them in order of date they were released, this way you will not spoil or mess up something for yourself. This episode does not contain any possible spoilers if you watched it first but I still highly suggest following that rule. 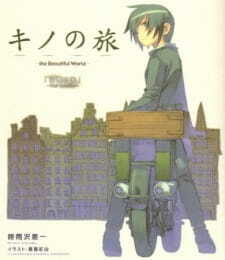 Kino no Tabi: The Beautiful World - Tou no Kuni is shorter then the usual episode but the story is still welly put together, doesn't seem rushed, and has the charm Kino no Tabi is known to have. In this country people are constantly putting their whole life into constructing a massive tower. I can't go much into story because spoilers but I definitely feel this is one of the odder countries. This episode does not really contain action (she does pull her gun out at a point tho) and is not one of the tragic episodes. The music in this episode seems to have a more Egyptian vibe to it. Possibly trying to connect a message about the construction of the pyramids and modern day civilization? I suggest watching this and trying to decipher it's message, especially if you enjoyed the rest of the series~! AKA Episode 00 - So, should I watch this first?